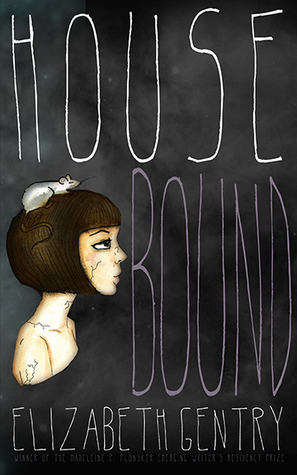 Elizabeth Gentry’s Housebound, and a Giveaway! I’m thrilled that today is publication day for my friend Elizabeth Gentry’s novel Housebound. I’ve been rereading it this week, and what a pleasure it’s been. As I wrote earlier, I read the novel in draft form and loved it then, so it was fun to reread and see what changes she’s made to make it even better. I’ve read a lot of Elizabeth’s writing over the years, and my response is always, oh, this is exactly the kind of writing I like! Things happen in her books, but the focus is on the characters and their experience of consciousness. The books are about what happens in the mind as much as in the world. Her writing has a very distinctive voice, a thoughtful, deeply insightful voice that makes me think about the world in a new way. But it’s also a little bit strange, in an entirely good way, a little eerie and dark. It’s beautiful, and entirely unconventional. Housebound tells the story of 19-year-old Maggie and her family, who live an isolated life in a large, oddly-shaped house. Maggie is the oldest of nine siblings, in a family that undermines the stereotype of large families as close-knit, their houses full of noise and chaos. This is a cautious, guarded family, with an emotionally-absent set of parents and a habit of watching each other carefully, making sure everyone follows the rules that, at this point, don’t have to be named. Everyone just knows what they are. The children are home-schooled, and their only social interaction, at least in recent years, is with neighbors they meet on the way to town to go to the library once a week. They spend their time doing their lessons, reading, and playing quiet games. They know that one of the rules is not to wander beyond the boundaries of their land; in particular, they are not supposed to visit their neighbors, who are few and far between. There were no more anecdotes, poetry recitations, ghost stories, contrived games, or late-night disclosures before the wood stove. Rather than building their knowledge of one another in successive cycles of irritation and love, memorizing each new layer as they aged and grew, the eleven members of the family had simply succumbed, once and for all, to a silence that turned them into strangers … They felt suspended, always waiting for someone else to make the first move — to take a turn with the bath, to return with fresh wood, to put the pot on to boil, to summon to supper, and most of all, to grow up and to leave. But now, Maggie has decided she’s ready for a job and drives into the nearby city with her father to find one. The events of the novel take place during the days between getting the job and moving to the city to start it, a strange, suspended time when Maggie is still part of the family, but newly separated from it as well. She begins to venture out into forbidden spaces, to visit the neighbors she’s not supposed to visit. The question of what Maggie will discover is what drives the plot forward, but along the way, there is so much to notice. The novel has a fairytale quality to it, with witch-like figures, frightening grandmothers, lost memories, suspended time, and the sense of a magic spell settling on the house. There is a definitive emphasis on the menacing, eerie aspects of fairy tales and the threatening sexuality that underlies many of them. Nature is menacing as well; rather than being a benign or a healing force, nature repulses and repels the characters. It’s forever threatening to invade their house — most importantly in the form of a rat that bites Maggie one night — and requires never-ending labor to contain. Even something as potentially pleasurable as reading takes on a dark cast in this novel: the characters are forever escaping into stories in ways that do not seem entirely healthy. The novel is about isolation and loneliness, as Maggie does battle in a sense against these menacing forces all by herself. The focus isn’t entirely on her, however; the point of view shifts regularly into that of other characters, so that we learn, slowly, what the other siblings and the parents are experiencing. We even, briefly, get into the perspective of the rat. This gives the book a sense of richness as we come to understand the emotional and psychological complexity of everything going on in this very quiet, seemingly still, house. So, as a way to celebrate publication day, I’d like to give away a copy of the book someone who might like to read it. If you would like a copy, just leave a comment on this post letting me know, and if more than one person is interested, I’ll choose a name at random at the end of the day next Friday. I’m happy to send the book internationally, so everyone is welcome. If you would like to get a sense of the writing, The Collagist has published an excerpt of the novel here. I love fairy-tale-esque stories, and the excerpt definitely piqued my interest in reading more. I’d be happy to be entered in the giveaway. Excellent, Teresa. I’ll put your name in. I’m so glad you liked the excerpt! This sounds like the sort of novel I would have put on my reading lists for students, especially those who had been looking at the history of the fairy tale and how it’s developed in our own time. I’m happy to be entered into the draw. I think it would be a great book to help think about modern uses of the fairy tale. I’d love to know what you think of it! This sounds fascinating! I’m in! Excellent, Jen, you’re entered. Thanks for stopping by! Heck yeah! I mean, yes, please include me in your giveaway. Mr. W — you’re in! Oh this sounds really good! Your description has me intrigued so please put my name in the hat 🙂 How was it reading your friend’s book? I know you read a draft so you were going to like it, but even then did you feel like you seeing a new or different side of your friend? Your name is in the hat! 🙂 I’ve been reading Elizabeth’s writing for something like 20 years now (I feel old), so it’s gotten to feel normal to me. But it’s still true that each piece of writing I read shows me something new about her, and mostly I’m amazed at her creativity. I certainly couldn’t think up those stories myself! This book really sounds intriguing, I’ll try to remember that I want to read it one day. It surely must be nice to have a friend who can tell such stories.